Former Judge Robert Nugent has ruled that the SARS commission on inquiry will not stop after lawyers for the tax agency's former commissioner Tom Moyane asked it be put on hold pending his upcoming disciplinary inquiry. Nugent, the commission's chair, was also asked to rule that all the evidence of the past three days - when Advocate Dali Mpofu, among others, gave evidence about Moyane - be expunged from the record. He said this was not possible. Nugent was further asked to rule that SARS must pay Moyane's legal costs, but said this was not possible in law. Moyane's legal team also asked that the commission not hear evidence that was related to Moyane's upcoming disciplinary hearing. Nugent said the inquiry could not do so as a matter of law. "The document is a disgrace," said Nugent in reference to the document submitted to him by Moyane’s lawyers last week. Fin24 has not seen the submission. Nugent said on Monday that the inquiry would continue, and the submission he received was littered with "abuse, invective and sinister suggestion". He said the inquiry could not dissolve itself, as it was established by presidential proclamation. "[The commission] has been instructed to fulfil its terms if reference," said Nugent, adding that Moyane was not placed in "double jeopardy" by the commission’s performance of its functions. 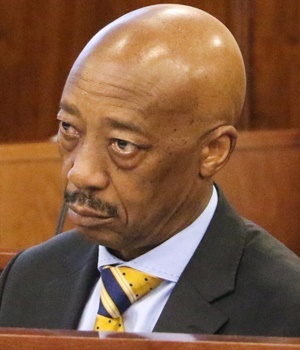 Nugent, a retired Supreme Court of Appeal judge, said that counsel for Moyane had also handed him a memory stick which was alleged to contain information proving the existence of a 'rogue unit' within the agency. "And he proposed that I share it with the media. If Mr Moyane wishes to distribute material to the media then he must do it himself," said Nugent. "The commission will certainly not do so on his behalf." Nugent said that, if it was relevant the the commission's terms of reference, the commission would investigate whether the rogue unit existed "through proper and credible evidence". Nugent said that evidence could not be expunged from the record, as he was chairing a commission of inquiry and not a court case. "[A commission of inquiry] must seek to establish facts, and the law does not require it to ignore evidence." He said it was not possible to make a ruling that evidence "disappear", as Moyane's counsel wanted. Nugent added that he would steer clear of matters that could come up in the Moyane inquiry "at this stage". "The commission is capable of carrying on its work, for a time, without covering ground that might be covered by the disciplinary inquiry. Lest if prejudice the work, I do not intend to do so at this stage," he said. Nugent further said that another criticism in the submission - that Moyane did not have the opportunity to "rebut" evidence against him, was disingenuous. He said that lawyers for Moyane had never requested that he rebut evidence. "Mr Moyane did not even attend the hearing," said Nugent.